Cloud computing model has four characteristics that make it unique from other similar computing models such as grid computing. According to (Carlin & Curran, 2012)  these four characteristics are 1) Multi-tenancy (Resource pooling) ability to create large resource pool and share among multiple users dynamically. 2) Massive Scalability (On-demand self-service) ability to use limited resources for initial implementation of a project then scale the amount of resources as needed without having to notify the vender. 3) Rapid Elasticity ability to increase users and resources. 4) Measure Service (Pay-per-Use) this is the ability to measure resources used such as the amount of time a VM is running, the amount of storage used or amount of data transferred (upload and download) and pay as you go. National Institute of Standard and Technology (NIST)  categorizes cloud deployment models into four (private, community, public and hybrid) and three service models (Software as a Service, Platform as a Service and Infrastructure as a Service). Gartner defines software as a service (SaaS) as software that is owned, delivered and managed remotely by one or more providers . Infrastructure as a service (IaaS) is a standardized, highly automated offering, where compute resources, complemented by storage and networking capabilities are owned and hosted by a service provider and offered to customers on-demand . 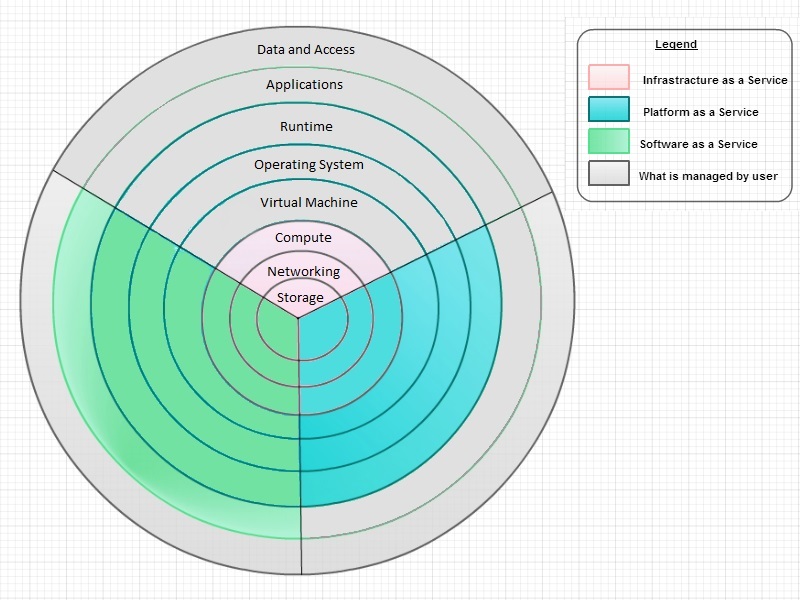 A platform as a service (PaaS) offering, usually depicted in all-cloud diagrams between the SaaS layer above it and the IaaS layer below, is a broad collection of application infrastructure (middleware) services (including application platform, integration, business process management and database services). Now let us take an example for each service type in relation to business intelligence (BI) on Microsoft cloud. We could use IaaS to host our existing applications such as data warehouse, ETL and SharePoint. PaaS delivers near real time reporting and we could use that service for our Operational Data Store (ODS) and archives. At last SaaS service is the best service to manage our self-service BI and we could use it to host our reports and analytics. In IaaS venders provide and storage, networking and compute. The rest of the layers from having VM to data and access are what is expected from users of the service. In PaaS delivers IaaS layers plus virtual machine, operating system and runtime. Users are expected to have their own applications and data access. SaaS has additional layers of Application. I created the figure below to show what each one of cloud service models provided by venders and what is expected from users. Heiser J. ( 2009) What you need to know about cloud computing security and compliance, Gartner, Research, ID Number: G00168345.